Q You draw these cartoons with a computer, right? A Wrong. The black-and-white line art for every Hamtoons custom cartoon QSL is drawn by hand by Jim Massara, N2EST, a professional cartoonist who worked for years in comic books and animation. Hand-drawn art gives these QSLs a warmth and personality that canned, computer-generated QSLs can’t match, the perfect thank-you after a QSO. 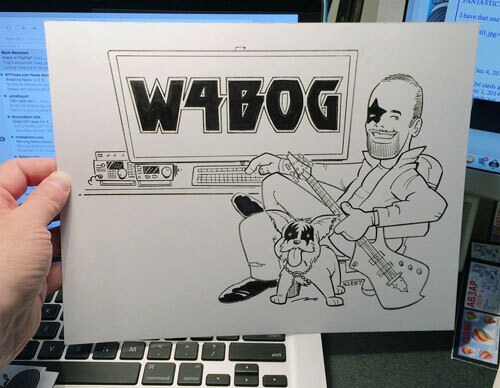 Best of all, when you commission a Hamtoons cartoon QSL, you also receive the original art, rendered with archival marker on letter-size Bristol board, suitable for framing! Q I want you to draw Homer Simpson / Peter Griffin / Mickey Mouse / Fred Flintstone / Superman / whoever for my QSL card. Can you do that? A Only with written permission from whoever owns the character, and you’ll have to secure that permission yourself. Be aware that media companies charge for use of their characters, often more than the typical ham can afford. Occasionally they will grant free clearance for use of their character if they think it will benefit them – for example, the appearance of a character on the QSL of a special-events station circulated throughout the world might be good PR — but that doesn’t happen often. Also, most media companies closely scrutinize use of their characters to keep the way they look consistent. That means that if I draw it, their licensing department will have to approve it and possibly ask for revisions, which means I spend more time and you spend more money. It’s a hassle you probably don’t want. Q Can you draw a caricature of me for my QSL card? A I can draw a cartoon likeness, but realize that it will be fairly “cartoony” and not like the sketches made by full-time caricature artists at fairs and amusement parks. My style is more like what you might see in a newspaper comic strip or an animated cartoon. Q Do you print the QSLs? A Yes. Hamtoons’ printing prices are competitive with other U.S. printers. Q Do you provide typography and a report form, too? A Yes. I either hand-letter or typeset your call sign and QTH information for the front of the card. I also have several standard report forms for the back. Q Do you have anything already drawn that I can put on my QSL card? A Not yet, but I’m working on it. Stay tuned.